We are always looking for new ways to go green. We have switched from Poland Spring bottled water to reusable aluminum water bottles. 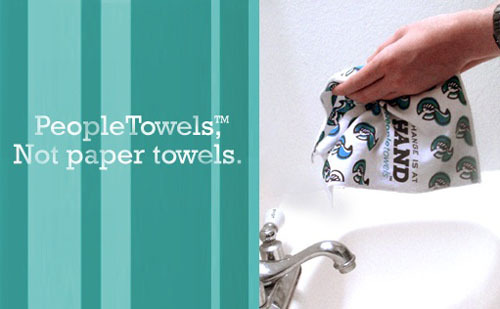 Now PeopleTowels brings us a new way to cut down on paper towels. “PeopleTowels™ is the newest concept in sustainability – 100% organic cotton, reusable personal hand towels that make going green as easy as drying your hands. 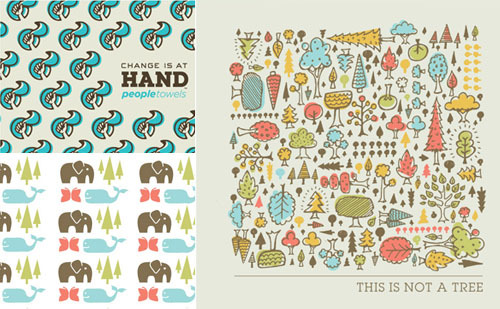 Switch from paper towels to PeopleTowels to dry your hands in public facilities to saves trees and reduce waste.” Switching to PeopleTowels for 1 year will save 1/4 of a tree, reduce landfill waste by 23lbs and conserve 250 gallons of water. Best of all they have some really cute designs. One Response to "A NEW ALTERNATIVE to paper towels"
I bought some “Ultimate Cloths” for cleaning & to stop using paper towels. They are ridiculously amazing. Dries things immediately, scoops up any mess, and no streaking- ever. They are an ultra micro fiber, feels like suede but not a shammy (sp?). If these hand towels are half as good as the ultimate cloth cleaning rags then they’re worth every penny.